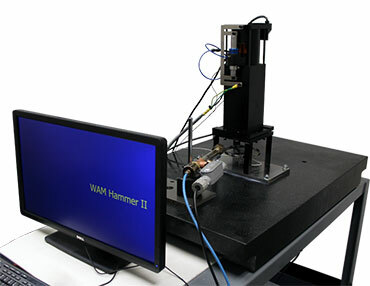 WAMhammer - Impact Test Machine | Wedeven Associates, Inc.
WAMhammer utilizes advanced control systems to evaluate the effects of repeated impacts on materials and coatings. The impact armature is guided by frictionless air bushings, and driven by a voice coil actuator. A laser rangefinder is used to provide position feedback to the control system, and to measure the impact and rebound velocities. Accelerometers and impact load cells are used to measure the impact forces. Impact forces of up to 7,000N at 30 Hz are possible. The machine can measure and control peak impact force, impact and rebound velocity, and frequency.